A dental filling is used to restore the form, function, and integrity of the tooth. Depending on the extent of the damage to the tooth, the filling procedure may take several steps. The first step always involves the removal of decayed or damaged tooth matter. There are two types of fillings: direct and indirect. 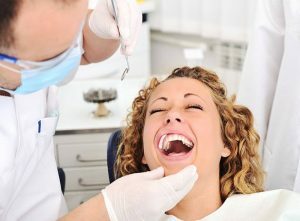 Direct fillings are performed by your dentist. When you receive a direct filling, the dentist will use a drill or other tools to remove the decayed and damaged portions of the tooth. Once the decay is cleaned out, the tooth is dried and sealed with a filling material. There is an array of materials available for dentists to use for dental fillings. The most common types of material are amalgam (silver) and tooth-colored. Amalgam fillings are made of a combination of metals, which include silver, tin, copper, and mercury. Amalagam is very durable and can easily withstand the grinding and chewing of your back teeth over long periods of time. However, it his highly visible and can increase sensitivity to temperature. Tooth-colored dental fillings are designed to match the color of your teeth to provide you with natural-looking results. These are most often used in teeth that are visible when you smile or speak. There are several different types of tooth-colored filling materials, including composites and glass ionomers. Glass ionomer can release fluoride, which helps to prevent decay, and they are usually recommended for children. These materials are soft and molded into the shape of your tooth before being hardened. The dentist can advise on the most suitable material for your tooth based on the size and location of the required filling. Tooth-colored composite fillings are very common because they can not only repair the tooth’s health but also restore its aesthetic appearance. Indirect fillings are also known as dental inlays and onlays, and they are sometimes referred to as “partial crowns.” Inlays are placed within the biting surface of the tooth, while onlays cover a larger area of the tooth. Like crowns, these restorations are made in a dental laboratory and then cemented to the tooth with a special adhesive. This procedure usually requires two visits to your dentist. Inlays and onlays are made from different tooth-colored materials, usually porcelain, composite material, or gold. They are suitable for the grinding surfaces of the molar teeth. After a dental filling procedure, you may experience minor discomfort when the anesthetic wears off. Your dentist may send you home with instructions to eat soft foods for the remainder of the day, and to avoid hot foods while the anesthetic is still in effect. By the following day, you should no longer feel any discomfort, and you can return to your normal habits.